amazing 3-dimensional wallpaper by Front. 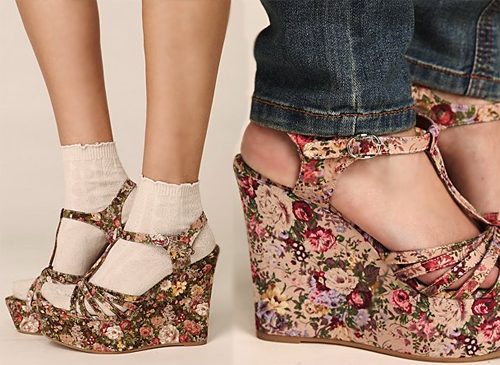 Hello gorgeous Jeffrey Campbell platforms! 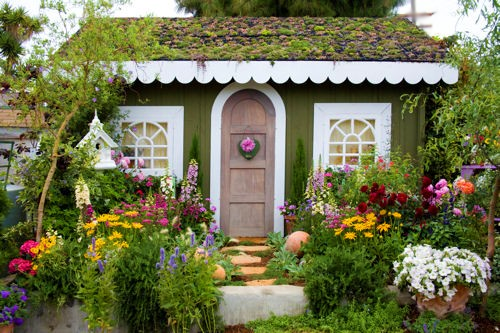 I'd move into this cheery little cottage in a heartbeat. Bring it on April showers! 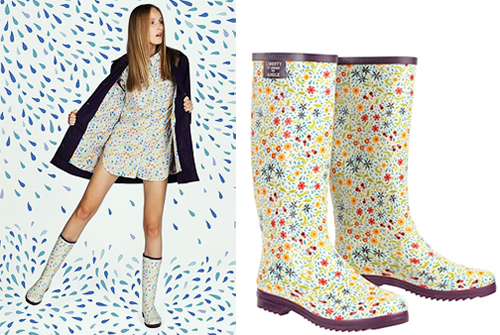 adorable Aigle Liberty rain boots first). cupcakes and berries? Yes, please! single piece in this Dolce and Gabbana ad. 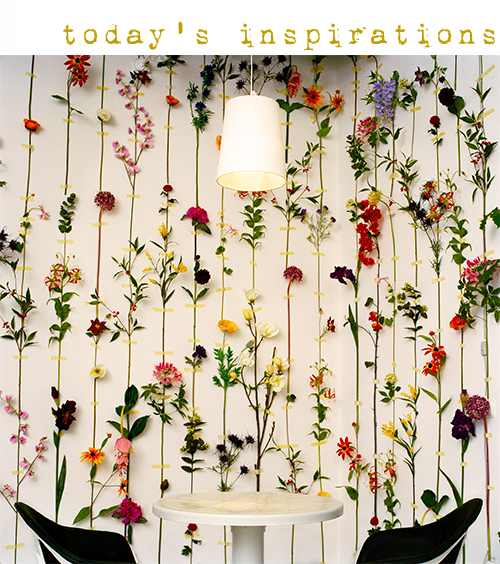 In case you haven't guessed by now, the focus of this week's Saturday Morning Daydreams is floral goodness. I bought the prettiest floral top Thursday, planted sunflowers and gerber daisy seeds this week (indoors; it snowed yesterday in Chicago! ), and am looking forward to giving my little sister an amazing vintage flower necklace as one of her birthday gifts (she drove up from Indianapolis early this morning and will be here any minute!). I hope these full-of-flower finds bring some spring-time inspiration to your weekend. Thank you for the sweet comments on my post yesterday about the sudden passing of my fiance's dear friend Todd. He was genuinely touched that my readers took the time to leave such compassionate messages. You are all amazing, and I'm incredibly appreciative of your support and kind words. Beautiful floral inspirations! Great pictures. Thanks for sharing. Lucky for floral fans, flowers are a big trend this season! Ohmygoodness--all so inspiring although my favorite is that first shot. How lovely to have a little home office with walls like that. Hey! You have got an absolutely WONDERFUL blog! I just found it from Moorea Seal's blog. So lovely. That wall of flowers is amazing! & those dresses are gorrrrrgeous!! I would love to live in that cute cottage & eat that delicious and cute looking cake. Oh my, that wallpaper is wonderful! I would be so happy in that room, or in the cottage for that matter! 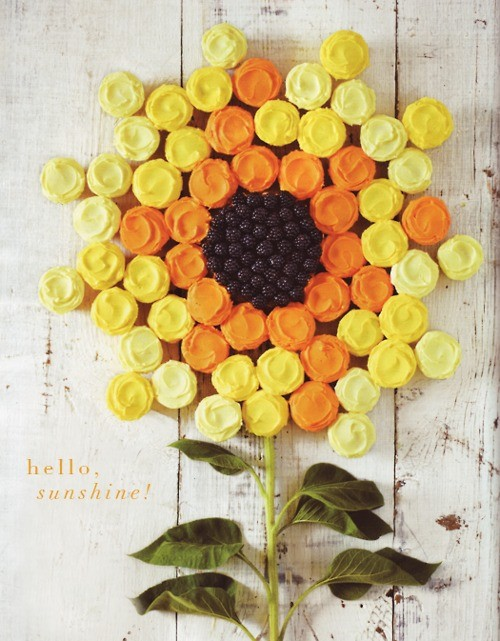 Love the sunflower cake too - must remember that! luv the wallpaper, house, platforms, D & G ad, that reminds me of the a spring ad from 2010, of a designer i can't recall or find stashed somewhere in my art piles i use for inspiration. melissa show us the floral top u bought yesterday! I love Jeffrey Campbell shoes. I used to buy shoes for comfort and practicality. But now I like to have a little fun and pretty in my step. Thanks so much for the sweet comments everyone! I really do love reading them. :) I'm a bit behind right now with my sis being in town this weekend and preparing to head out of town for a few days for Robbie's dear friend's funeral, but I definitely plan to check out all of your wonderful blogs ASAP. I hope you all had lovely weekends.